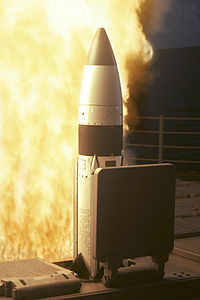 An anti-ballistic missile (ABM) is a surface-to-air missile designed to counter ballistic missiles (see missile defense). Ballistic missiles are used to deliver nuclear, chemical, biological, or conventional warheads in a ballistic flight trajectory. The term "anti-ballistic missile" is a generic term conveying a system designed to intercept and destroy any type of ballistic threat, however it is commonly used for systems specifically designed to counter intercontinental ballistic missiles (ICBMs). There are only three systems in the world that can intercept ICBMs. Besides them, some smaller systems exist (tactical ABMs), that generally cannot intercept intercontinental strategic missiles, even if within range—an incoming ICBM simply moves too fast for these systems. The Russian A-135 anti-ballistic missile system is used for the defense of Moscow. It became operational in 1995 and was preceded by the A-35 anti-ballistic missile system. The system uses Gorgon and Gazelle missiles with nuclear warheads to intercept incoming ICBMs. The Israeli Arrow 3 system entered operational service in 2017. It is designed for exo-atmosphere interception of ballistic missiles during the spaceflight portion of their trajectory, including those of ICBMs. It may also act as an anti-satellite weapon. During 1993, a symposium was held by western European nations to discuss potential future ballistic missile defence programs. In the end, the council recommended deployment of early warning and surveillance systems as well as regionally controlled defence systems. During spring 2006 reports about negotiations between the United States and Poland as well as the Czech Republic were published. The plans propose the installation of a latest generation ABM system with a radar site in the Czech Republic and the launch site in Poland. The system was announced to be aimed against ICBMs from Iran and North Korea. This caused harsh comments by Russian President Vladimir Putin at the Organization for Security and Co-operation in Europe (OSCE) security conference during spring 2007 in Munich. Other European ministers commented that any change of strategic weapons should be negotiated on NATO level and not 'unilaterally' [sic, actually bilaterally] between the U.S. and other states (although most strategic arms reduction treaties were between the Soviet Union and U.S., not NATO). German foreign minister Frank-Walter Steinmeier expressed severe concerns about the way in which the U.S. had conveyed its plans to its European partners and criticised the U.S. administration for not having consulted Russia prior to announcing its endeavours to deploy a new missile defence system in Central Europe. As of July 2007, a majority of Poles were opposed to hosting a component of the system in Poland. By 28 July 2016 Missile Defense Agency planning and agreements had clarified enough to give more details about the Aegis Ashore sites in Romania (2014) and Poland (2018). Project 640 had been the PRC's indigenous effort to develop ABM capability. The Academy of Anti-Ballistic Missile & Anti-Satellite was established from 1969 for the purpose of developing Project 640. The project was to involve at least three elements, including the necessary sensors and guidance/command systems, the Fan Ji (FJ) missile interceptor, and the XianFeng missile-intercepting cannon. The FJ-1 had completed two successful flight tests during 1979, while the low-altitude interceptor FJ-2 completed some successful flight tests using scaled prototypes. A high altitude FJ-3 interceptor was also proposed. Despite the development of missiles, the programme was slowed down due to financial and political reasons. It was finally closed down during 1980 under a new leadership of Deng Xiaoping as it was seemingly deemed unnecessary after the 1972 Anti-Ballistic Missile Treaty between the Soviet Union and the United States and the closure of the US Safeguard ABM system. In March 2006, China tested an interceptor system comparable to the U.S. Patriot missiles. China has acquired and is license-producing the S-300PMU-2/S-300PMU-1 series of terminal ABM-capable SAMs. China-produced HQ-9 SAM system may possess terminal ABM capabilities. PRC Navy's operating modern air-defense destroyers known as the Type 052C Destroyer and Type 051C Destroyer are armed with naval HHQ-9 missiles. The HQ-19, similar to the THAAD, was first tested in 2003, and subsequently a few more times, including in November 2015. The HQ-29, a counterpart to the MIM-104F PAC-3, was first tested in 2011. The technology and experience from the successful anti-satellite test using a ground-launched interceptor during January 2007 was immediately applied to current ABM efforts and development. China carried out a land-based anti-ballistic missile test on 11 January 2010. The test was exoatmospheric and done in midcourse phase and with a kinetic kill vehicle. China is the second country after US that demonstrated intercepting ballistic missile with a kinetic kill vehicle, the interceptor missile was a SC-19. The sources suggest the system is not operationally deployed as of 2010. Italy and France have developed a missile family called Aster (Aster 15 and Aster 30). Aster 30 is capable of ballistic missile defense. On 18 October 2010, France announced a successful tactical ABM test of the Aster 30 missile and on 1 December 2011 a successful interception of a Black Sparrow ballistic target missile. Royal Navy Type 45 destroyers and French Navy and Italian Navy Horizon -class frigates are armed with PAAMS, using Aster 15 and Aster 30 missiles. is in developing another version, the Aster 30 block II, which can destroy ballistic missiles at a maximum range of 3000 km. It will have a Kill Vehicle warhead. India has an active ABM development effort using indigenously developed and integrated radars, and indigenous missiles. 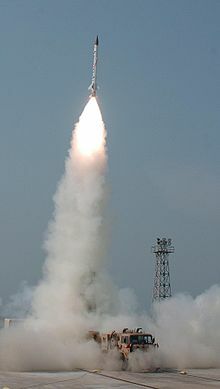 In November 2006, India successfully conducted the PADE (Prithvi Air Defence Exercise) in which an anti-ballistic missile, called the Prithvi Air Defence (PAD), an exo-atmospheric (outside the atmosphere) interceptor system, intercepted a Prithvi-II ballistic missile. The PAD missile has the secondary stage of the Prithvi missile and can reach altitude of 80 km (50 mi). During the test, the target missile was intercepted at a 50 km (31 mi) altitude. India became the fourth nation in the world after United States, Russia, and Israel to acquire such a capability and the third nation to acquire it using in-house research and development. On 6 December 2007, the Advanced Air Defence (AAD) missile system was tested successfully. This missile is an Endo-atmospheric interceptor with an altitude of 30 km (19 mi). In 2009, reports emerged of a new missile named the PDV. The DRDO is developing a new Prithvi interceptor missile code-named PDV. The PDV is designed to take out the target missile at altitudes above 150 km (93 mi). The first PDV was successfully test fired on 27 April 2014. According to scientist V K Saraswat of DRDO, the missiles will work in tandem to ensure a hit probability of 99.8 percent. On 15 May 2016 India successfully launched advanced Defence interceptor missile named Ashvin interceptor missile from Abdul Kalam Island from Odisha coast. The Arrow project was begun after the U.S. and Israel agreed to co-fund it on 6 May 1986. 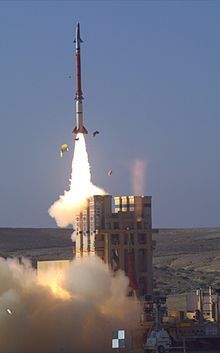 The Arrow ABM system was designed and constructed in Israel with financial support by the United States by a multibillion-dollar development program called "Minhelet Homa" (Wall Administration) with the participation of companies like Israel Military Industries, Tadiran and Israel Aerospace Industries. During 1998 the Israeli military conducted a successful test of their Arrow missile. Designed to intercept incoming missiles travelling at up to 2 mile/s (3 km/s), the Arrow is expected to perform much better than the Patriot did in the Gulf War. 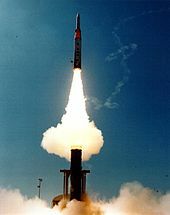 On 29 July 2004 Israel and the United States carried out joint experiment in the US, in which the Arrow was launched against a real Scud missile. The experiment was a success, as the Arrow destroyed the Scud with a direct hit. During December 2005 the system was deployed successfully in a test against a replicated Shahab-3 missile. This feat was repeated on 11 February 2007. The Arrow 3 system is capable of exo-atmosphere interception of ballistic missiles, including of ICBMs. It also acts as an anti-satellite weapon. Lieutenant General Patrick J. O'Reilly, Director of the US Missile Defense Agency, said: "The design of Arrow 3 promises to be an extremely capable system, more advanced than what we have ever attempted in the U.S. with our programs." David's Sling (Hebrew: קלע דוד), also sometimes called Magic Wand (Hebrew: שרביט קסמים), is an Israel Defense Forces military system being jointly developed by the Israeli defense contractor Rafael Advanced Defense Systems and the American defense contractor Raytheon, designed to intercept tactical ballistic missiles, as well as medium- to long-range rockets and slower-flying cruise missiles, such as those possessed by Hezbollah, fired at ranges from 40 km to 300 km. It is designed with the aim of intercepting the newest generation of tactical ballistic missiles, such as Iskander. Japanese guided missile destroyer JDS Kongō (DDG-173) firing a Standard Missile 3 anti-ballistic missile. Since 1998, when North Korea launched a Taepodong-1 missile over northern Japan, the Japanese have been jointly developing a new surface-to-air interceptor known as the Patriot Advanced Capability 3 (PAC-3) with the US. So far tests have been successful, and there are planned 11 locations that the PAC-3 will be installed. A military spokesman said that tests had been done on two sites, one of them a business park in central Tokyo, and Ichigaya – a site not far from the Imperial Palace. Along with the PAC-3, Japan has installed a US-developed ship-based anti-ballistic missile system, which was tested successfully on 18 December 2007. The missile was launched from a Japanese warship, in partnership with the U.S. Missile Defense Agency and destroyed a mock target launched from the coast. Apart from the main Moscow deployment, Russia has striven actively for intristic ABM capabilities of its SAM systems. United States Navy RIM-161 Standard Missile 3 anti-ballistic missile. In several tests, the U.S. military have demonstrated the feasibility of destroying long and short range ballistic missiles. Combat effectiveness of newer systems against 1950s tactical ballistic missiles seems very high, as the MIM-104 Patriot (PAC-1 and PAC-2) had a 100% success rate in Operation Iraqi Freedom. 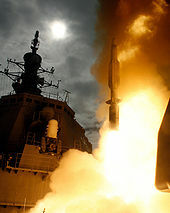 The U.S. Navy Aegis combat system uses RIM-161 Standard Missile 3, which hit a target going faster than ICBM warheads. These systems, as opposed to U.S. GMD system, are not capable of a mid-course intercept of an ICBM. Kestrel eye is a cubesat swarm designed to produce a picture of a designated ground target, and to relay the picture to the ground Warfighter every 10 minutes. Procurement of MIM-104 Patriot and indigenous Tien-Kung anti-ballistic missile systems. The idea of destroying rockets before they can hit their target dates from the first use of modern missiles in warfare, the German V-1 and V-2 program of World War II. British fighters destroyed some V-1 "buzz bombs" in flight, although concentrated barrages of heavy anti-aircraft artillery had greater success. Under the lend-lease program, 200 US 90 mm AA guns with SCR-584 radars and Western Electric/Bell Labs computers were sent to the UK. These demonstrated a 95% success rate against V-1s that flew into their range. The V-2, the first true ballistic missile, was impossible to destroy in the air. SCR-584's could be used to plot the trajectories of the missiles and provide some warning, but were more useful in backtracking their ballistic trajectory and determining the rough launch locations. The Allies launched Operation Crossbow to find and destroy V-2s before launch, but these operations were largely ineffective. In one instance a Spitfire happened upon a V-2 rising through the trees, and fired on it with no effect. This led to allied efforts to capture launching sites in Belgium and the Netherlands. A wartime study by Bell Labs into the task of shooting down ballistic missiles in flight concluded it was not possible. In order to intercept a missile, one needs to be able to steer the attack onto the missile before it hits. A V-2's speed would require guns of effectively infinite reaction time, or some sort of weapon with ranges on the order of dozens of miles, neither of which appeared possible. This was, however, just before the emergence of high-speed computing systems. By the mid-1950s, things had changed considerably, and many forces worldwide were considering ABM systems. The American armed forces began experimenting with anti-missile missiles soon after World War II, as the extent of German research into rocketry became clear. Project Wizard began in 1946, with the aim of creating a missile capable of intercepting the V-2. But defences against Soviet long-range bombers took priority until 1957, when the Soviet Union demonstrated its advances in ICBM technology with the launch of Sputnik, the Earth's first artificial satellite. The US Army accelerated development of their LIM-49 Nike Zeus system in response. Zeus was criticized throughout its development program, especially from those within the US Air Force and nuclear weapons establishments who suggested it would be much simpler to build more nuclear warheads and guarantee mutually assured destruction. Zeus was eventually cancelled in 1963. In 1958, the U.S. sought to explore whether airbursting nuclear weapons might be used to ward off ICBMs. It conducted several test explosions of low-yield nuclear weapons — 1.7kt boosted fission W25 warheads — launched from ships to very high altitudes over the southern Atlantic Ocean. Such an explosion releases a burst of X-rays in the Earth's atmosphere, causing secondary showers of charged particles over an area hundreds of miles across. These can become trapped in the Earth' magnetic field, creating an artificial radiation belt. It was believed that this might be strong enough to damage warheads traveling through the layer. This proved not to be the case, but Argus returned key data about a related effect, the Nuclear electromagnetic pulse (NEMP). Other countries were also involved in early ABM research. A more advanced project was at CARDE in Canada, which researched the main problems of ABM systems. A key problem with any radar system is that the signal is in the form of a cone, which spreads with distance from the transmitter. For long-distance interceptions like ABM systems, the inherent inaccuracy of the radar makes an interception difficult. CARDE considered using a terminal guidance system to address the accuracy concerns, and developed several advanced infrared detectors for this role. They also studied a number of missile airframe designs, a new and much more powerful solid rocket fuel, and numerous systems for testing it all. After a series of drastic budget reductions during the late 1950s the research ended. One offshoot of the project was Gerald Bull's system for inexpensive high-speed testing, consisting of missile airframes shot from a sabot round, which would later be the basis of Project HARP. Another was the CRV7 and Black Brant rockets, which used the new solid rocket fuel. 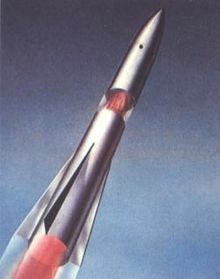 The Soviet military had requested funding for ABM research as early as 1953, but were only given the go-ahead to begin deployment of such a system on 17 August 1956. 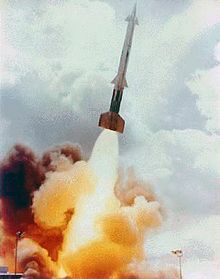 Their test system, known simply as System A, was based on the V-1000 missile, which was similar to the early US efforts. The first successful test interception was carried out on 24 November 1960, and the first with a live warhead on 4 March 1961. In this test, a dummy warhead was released by a R-12 ballistic missile launched from the Kapustin Yar, and intercepted by a V-1000 launched from Sary-Shagan. The dummy warhead was destroyed by the impact of 16,000 tungsten-carbide spherical impactors 140 seconds after launch, at an altitude of 25 km (82,000 ft). The V-1000 missile system was nonetheless considered not reliable enough and abandoned in favour of nuclear-armed ABMs. A much larger missile, the Fakel 5V61 (known in the west as Galosh), was developed to carry the larger warhead and carry it much further from the launch site. Further development continued, and the A-35 anti-ballistic missile system, designed to protect Moscow, became operational in 1971. A-35 was designed for exoatmospheric interceptions, and would have been highly susceptible to a well-arranged attack using multiple warheads and radar black-out techniques. A-35 was upgraded during the 1980s to a two-layer system, the A-135. The Gorgon (SH-11/ABM-4) long-range missile was designed to handle intercepts outside the atmosphere, and the Gazelle (SH-08/ABM-3) short-range missile endoatmospheric intercepts that eluded Gorgon. The A-135 system is considered to be technologically equivalent to the United States Safeguard system of 1975. Nike Zeus failed to be a credible defence in an era of rapidly increasing ICBM counts due to its ability to attack only one target at a time. Additionally, significant concerns about its ability to successfully intercept warheads in the presence of high-altitude nuclear explosions, including its own, lead to the conclusion that the system would simply be too costly for the very low amount of protection it could provide. By the time it was cancelled in 1963, potential upgrades had been explored for some time. Among these were radars capable of scanning much greater volumes of space and able to track many warheads and launch several missiles at once. These, however, did not address the problems identified with radar blackouts caused by high-altitude explosions. To address this need, a new missile with extreme performance was designed to attack incoming warheads at much lower altitudes, as low as 20 km. The new project encompassing all of these upgrades was launched as Nike-X. The main missile was LIM-49 Spartan—a Nike Zeus upgraded for longer range and a much larger 5 megaton warhead intended to destroy enemy's warheads with a burst of x-rays outside the atmosphere. A second shorter-range missile called Sprint with very high acceleration was added to handle warheads that evaded longer-ranged Spartan. Sprint was a very fast missile (some sources[who?] claimed it accelerated to 8,000 mph (13 000 km/h) within 4 seconds of flight—an average acceleration of 90 g) and had a smaller W66 enhanced radiation warhead in the 1–3 kiloton range for in-atmosphere interceptions. The experimental success of Nike X persuaded the Lyndon B. Johnson administration to propose a thin ABM defense, that could provide almost complete coverage of the United States. In a September 1967 speech, Defense Secretary Robert McNamara referred to it as "Sentinel". McNamara, a private ABM opponent because of cost and feasibility (see cost-exchange ratio), claimed that Sentinel would be directed not against the Soviet Union's missiles (since the USSR had more than enough missiles to overwhelm any American defense), but rather against the potential nuclear threat of the People's Republic of China. In the meantime, a public debate over the merit of ABMs began. Difficulties that had already made an ABM system questionable for defending against an all-out attack. One problem was the Fractional Orbital Bombardment System (FOBS) that would give little warning to the defense. Another problem was high altitude EMP (whether from offensive or defensive nuclear warheads) which could degrade defensive radar systems. When this proved infeasible for economic reasons, a much smaller deployment using the same systems was proposed, namely Safeguard (described later). Testing of the LGM-118A Peacekeeper re-entry vehicles, all eight shot from only one missile. Each line represents the path of a warhead which, were it live, would detonate with the explosive power of twenty-five Hiroshima-style weapons. ABM systems were developed initially to counter single warheads launched from large Intercontinental ballistic missiles (ICBMs). The economics seemed simple enough; since rocket costs increase rapidly with size, the price of the ICBM launching a large warhead should always be greater than the much smaller interceptor missile needed to destroy it. In an arms race the defense would always win. In practice, the price of the interceptor missile was considerable, due to its sophistication. The system had to be guided all the way to an interception, which demanded guidance and control systems that worked within and outside the atmosphere. The Nike Zeus was expected to cost about $1 million, about the same as an ICBM. However, due to their relatively short ranges, an ABM missile would be needed to counter an ICBM wherever it might be aimed. That implies that dozens of interceptors are needed for every ICBM. This led to intense debates about the "cost-exchange ratio" between interceptors and warheads. 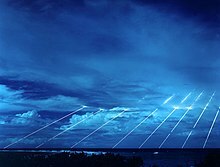 Conditions changed dramatically in 1970 with the introduction of multiple independently targetable reentry vehicle (MIRV) warheads. Suddenly, each launcher was throwing not one warhead, but several. These would spread out in space, ensuring that a single interceptor would be needed for each warhead. This simply added to the need to have several interceptors for each warhead in order to provide geographical coverage. Now it was clear that an ABM system would always be many times more expensive than the ICBMs they defended against. Technical, economic and political problems described resulted in the ABM treaty of 1972, which restricted the deployment of strategic (not tactical) anti-ballistic missiles. By the ABM treaty and a 1974 revision, each country was allowed to deploy a mere 100 ABMs to protect a single, small area. The Soviets retained their Moscow defences. The U.S. designated their ICBM sites near Grand Forks Air Force Base, North Dakota, where Safeguard was already under advanced development. The radar systems and anti-ballistic missiles were approximately 90 miles north/northwest of Grand Forks AFB, near Concrete, North Dakota. The missiles were deactivated in 1975. The main radar site (PARCS) is still used as an early warning ICBM radar, facing relative north. It is located at Cavalier Air Force Station, North Dakota. The U.S. Safeguard system, which utilized the nuclear-tipped LIM-49A Spartan and Sprint missiles, in the short operational period of 1975/1976, was the second counter-ICBMs system in the world. Safeguard protected only the main fields of US ICBMs from attack, theoretically ensuring that an attack could be responded to with a US launch, enforcing the mutually assured destruction principle. The Reagan-era Strategic Defense Initiative (often referred to as "Star Wars"), along with research into various energy-beam weaponry, brought new interest in the area of ABM technologies. SDI was an extremely ambitious program to provide a total shield against a massive Soviet ICBM attack. The initial concept envisioned large sophisticated orbiting laser battle stations, space-based relay mirrors, and nuclear-pumped X-ray laser satellites. Later research indicated that some planned technologies such as X-ray lasers were not feasible with then-current technology. As research continued, SDI evolved through various concepts as designers struggled with the difficulty of such a large complex defense system. SDI remained a research program and was never deployed. Several post-SDI technologies are used by the present Missile Defense Agency (MDA). Lasers originally developed for the SDI plan are in use for astronomical observations. Used to ionize gas in the upper atmosphere, they provide telescope operators with a target to calibrate their instruments. The Israeli Arrow missile system was tested initially during 1990, before the first Gulf War. The Arrow was supported by the United States throughout the 1990s. The Patriot was the first deployed tactical ABM system, although it was not designed from the outset for that task and consequently had limitations. It was used during the 1991 Gulf War to attempt to intercept Iraqi Scud missiles. Post-war analyses show that the Patriot was much less effective than initially thought because of its radar and control system's inability to discriminate warheads from other objects when the Scud missiles broke up during reentry. Testing ABM technology continued during the 1990s with mixed success. After the Gulf War, improvements were made to several U.S. air defense systems. A new Patriot, PAC-3, was developed and tested—a complete redesign of the PAC-2 deployed during the war, including a totally new missile. The improved guidance, radar and missile performance improves the probability of kill over the earlier PAC-2. During Operation Iraqi Freedom, Patriot PAC-3s had a nearly 100% success rate against Iraqi TBMs fired. However, since no longer range Iraqi Scud missiles were used, PAC-3 effectiveness against those was untested. Patriot was involved in three friendly fire incidents: two incidents of Patriot shootings at coalition aircraft and one of U.S. aircraft shooting at a Patriot battery. A new version of the Hawk missile was tested during the early to mid-1990s and by the end of 1998 the majority of US Marine Corps Hawk systems were modified to support basic theater anti-ballistic missile capabilities. MIM-23 Hawk missile is not operational in the U.S. service since 2002, but is used by many other countries. Soon after the Gulf war, the Aegis combat system was expanded to include ABM capabilities. The Standard missile system was also enhanced and tested for ballistic missile interception. During the late 1990s, SM-2 block IVA missiles were tested in a theater ballistic missile defense function. Standard Missile 3 (SM-3) systems have also been tested for an ABM role. In 2008, an SM-3 missile launched from a Ticonderoga-class cruiser, the USS Lake Erie, successfully intercepted a non-functioning satellite. From 1992 to 2000, a demonstration system for the US Army Terminal High Altitude Area Defense was deployed at White Sands Missile Range. Tests were conducted on a regular basis and resulted in early failures, but successful intercepts occurred from 1999 onward. Full fielding of the first THAAD battery began in 2009. Approved for acquisition by the Pentagon during 1991 but never realized, Brilliant Pebbles was a proposed space-based anti-ballistic system that was meant to avoid some of the problems of the earlier SDI concepts. Rather than use sophisticated large laser battle stations and nuclear-pumped X-ray laser satellites, Brilliant Pebbles consisted of a thousand very small, intelligent orbiting satellites with kinetic warheads. The system relied on improvements of computer technology, avoided problems with overly centralized command and control and risky, expensive development of large, complicated space defense satellites. It promised to be much less expensive to develop and have less technical development risk. The name Brilliant Pebbles comes from the small size of the satellite interceptors and great computational power enabling more autonomous targeting. Rather than rely exclusively on ground-based control, the many small interceptors would cooperatively communicate among themselves and target a large swarm of ICBM warheads in space or in the late boost phase. Development was discontinued later in favor of a limited ground-based defense. While the Reagan era Strategic Defense Initiative was intended to shield against a massive Soviet attack, during the early 1990s, President George H. W. Bush called for a more limited version using rocket-launched interceptors based on the ground at a single site. Such system was developed since 1992, was expected to become operational in 2010 and capable of intercepting small number of incoming ICBMs. 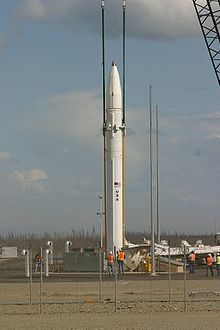 First called the National Missile Defense (NMD), since 2002 it was renamed Ground-Based Midcourse Defense (GMD). It was planned to protect all 50 states from a rogue missile attack. The Alaska site provides more protection against North Korean missiles or accidental launches from Russia or China, but is likely less effective against missiles launched from the Middle East. The Alaska interceptors may be augmented later by the naval Aegis Ballistic Missile Defense System or by ground-based missiles in other locations. During 1998, Defense secretary William Cohen proposed spending an additional $6.6 billion on intercontinental ballistic missile defense programs to build a system to protect against attacks from North Korea or accidental launches from Russia or China. In terms of organization, during 1993 SDI was reorganized as the Ballistic Missile Defense Organization (BMDO). In 2002, it was renamed to Missile Defense Agency (MDA). 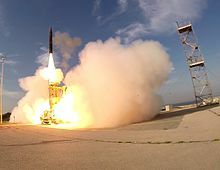 On 13 June 2002, the United States withdrew from the Anti-Ballistic Missile Treaty and recommenced developing missile defense systems that would have formerly been prohibited by the bilateral treaty. The action was stated as needed to defend against the possibility of a missile attack conducted by a rogue state. The next day, the Russian Federation dropped the START II agreement, intended to completely ban MIRVs. On 15 December 2016, the US Army SMDC had a successful test of a U.S. Army Zombie Pathfinder rocket, to be used as a target for exercising various anti-ballistic missile scenarios. The rocket was launched as part of NASA's sounding rocket program, at White Sands Missile Range. ^ Assembly of the Western European Union. Technological and Aerospace Committee. Lenzer. via FAS.Anti-missile defence for Europe – guidelines drawn from the symposium. 17 May 1993. ^ a b c d "MDA International cooperation". ^ Gaspers, J. (2007). A US Missile Defence Shield in Europe? Opinions and Arguments in the German Political Debate. Natolin Analyses 7(20)/2007. ^ "55% Polaków przeciw budowie tarczy (55% of Poles against building the Shield)" (in Polish). Polska Agencja Prasowa. 17 July 2007. Retrieved 7 September 2007. ^ "(28 July 2016) Aegis Ashore" (PDF). ^ a b c d e "Project 640: China's National Missile Defence in the '70s". SinoDefence.com. Archived from the original on 13 December 2011. Retrieved 11 May 2012. ^ "donga.com[English donga]". English.donga.com. 28 March 2006. Retrieved 11 May 2012. ^ "Chinese Version of Patriot Interceptor Said Undergoing Tests". MissileThreat. 29 March 2006. Archived from the original on 20 July 2012. Retrieved 11 May 2012. ^ "Pentagon Received No Warning of Chinese Missile Defense Test". Globalsecuritynewswire.org. Retrieved 11 May 2012. ^ "HongQi 9 (HQ-9) Surface-to-Air Missile System". SinoDefence.com. 3 October 2009. Archived from the original on 4 September 2013. Retrieved 11 May 2012. ^ Axe, David (11 November 2015). "Did China Just Test a New Satellite-Killer?". The Daily Beast. Retrieved 21 July 2017. ^ Pike, John. "HQ-29 Anti-Ballistic Missile Interceptor". www.globalsecurity.org. Retrieved 21 July 2017. ^ a b c Pike, John. "HQ-19 Anti-Ballistic Missile Interceptor". www.globalsecurity.org. Retrieved 21 July 2017. ^ "HQ-18 (S-300V) (China) – Jane's Strategic Weapon Systems". Articles.janes.com. 16 December 2011. Retrieved 11 May 2012. ^ "Hongqi-15 (HQ-15)". MissileThreat. Archived from the original on 5 May 2012. Retrieved 11 May 2012. ^ "4. Anti-Stealth and Countermeasures". SinoDefence.com. Archived from the original on 18 May 2012. Retrieved 11 May 2012. ^ "China Adds Precision Strike To Capabilities". Aviationweek.com. Retrieved 11 May 2012. ^ a b c "Demarche Following China's January 2010 Intercept Flight-Test". The Daily Telegraph. London. 2 February 2011. ^ 我国试验陆基反导 此前仅美国进行过相关试验 (in Chinese). SINA News. 12 January 2010. Archived from the original on 14 January 2010. Retrieved 11 January 2010. ^ "NTI". Global Security Newswire. Retrieved 11 May 2012. ^ "China test-fires anti-ballistic missile". english.ruvr.ru. Archived from the original on 16 May 2013. Retrieved 21 July 2017. ^ Australia, Air Power. "China's Anti-Ballistic Missile Test: Much Ado About Nothing". www.ausairpower.net. Retrieved 21 July 2017. ^ "SAMP/T Successful on First European Missile Defense Intercept Test". Defense Update. 26 November 2010. Archived from the original on 29 November 2010. Retrieved 26 November 2010. ^ "Premier tir anti-balistique | Blog de la DE". Ead-minerve.fr. Archived from the original on 26 April 2012. Retrieved 11 May 2012. ^ "Une première en France : un missile intercepté par un antimissile Aster" (in French). Marianne2.fr. Archived from the original on 5 September 2012. Retrieved 11 May 2012. ^ Prithvi Mission Milestone in Missile Defence Archived 8 December 2007 at the Wayback Machine. ^ Outlook India. India develops new anti-missile system. 27 November 2006. ^ "INDIA successfully conducts interceptor supersonic missile test". Pib.nic.in. Retrieved 11 May 2012. ^ "DRDO to launch series of missiles". The Hindu. Retrieved 6 December 2012. ^ "India Successfully Test-Fires New Interceptor Missile". News.outlookindia.com. Archived from the original on 28 April 2014. Retrieved 30 April 2014. ^ Rajat Pandit (26 November 2007). "India on way to joining exclusive BMD club". The Times of India. Retrieved 11 May 2012. ^ Diplomat, Franz-Stefan Gady, The. "India Successfully Tests Supersonic Interceptor Missile". Retrieved 21 July 2017. ^ "Israeli-United States Relations". Policy almanac. Archived from the original on 4 November 2002. Retrieved 11 May 2012. ^ "Israeli missile test 'successful'". News. BBC. 11 February 2007. Retrieved 25 April 2010. ^ a b Opall-Rome, Barbara (10 December 2015). "US-Israel Arrow-3 intercepts target in space". Defense News. Retrieved 10 December 2015. ^ "Japan plans Tokyo missile shield". BBC News. 15 January 2008. ^ John Pike. "GlobalSystems: ABM-1". Globalsecurity.org. Retrieved 11 May 2012. ^ a b John Pike (20 April 2018). "Galosh - Moscow System". Globalsecurity.org. Retrieved 8 October 2018. ^ Sean O'Connor (27 January 2014). "Russian/Soviet Anti-Ballistic Missile Systems". Retrieved 8 October 2018. ^ John Pike (20 April 2018). "51T6 Gorgon". Globalsecurity.org. Retrieved 8 October 2018. ^ John Pike. "Operation Iraqi Freedom – Patriot". GlobalSecurity.org. Retrieved 11 May 2012. ^ "BBC NEWS – World – Americas – US missile hits 'toxic satellite'". news.bbc.co.uk. Retrieved 21 July 2017. ^ Panda, Ankit. "What Is THAAD, What Does It Do, and Why Is China Mad About It?". The Diplomat. Retrieved 3 April 2017. ^ Jen Judson (11 Oct 2018) So Patriot and THAAD will talk. What does that really mean? ^ "Army Seeks To Field One-Size-Fits-All Battle Command System". Space News. 29 June 2004. ^ Kiley, Gregory T. (17 May 2017). "Congress and the Administration Must Reassess Failing Missile Defense Programs". RealClearDefense. ^ Northrop Grumman (6 June 2017). "S-280 - the Engagement Operations Center for the Integrated Battle Command System" – via YouTube. ^ Ramsey, Syed (12 May 2016). Tools of War: History of Weapons in Modern Times. Vij Books India Pvt Ltd. ISBN 9789386019837. ^ Nuclear Weapon Archive.org. Argus. ^ Gobarev, Victor (2001). "The early development of Russia's ballistic missile defense system". The Journal of Slavic Military Studies. 14 (2): 29–48. doi:10.1080/13518040108430478. Viewed 26 May 2012. ^ Karpenko, A (1999). "ABM AND SPACE DEFENSE". Nevsky Bastion. 4: 2–47. ^ GlobalSecurity.org. -135 anti-ballistic missile system. ^ Defense Science Board Task Force. Patriot system performance – report summary Archived 26 February 2006 at the Wayback Machine. (PDF) January 2005. ^ "DoD Succeeds In Intercepting Non-Functioning Satellite" (Press release). U.S. Department of Defense. 20 February 2008. Archived from the original on 26 February 2008. Retrieved 20 February 2008. ^ "Navy Succeeds In Intercepting Non-Functioning Satellite" (Press release). U.S. Navy. 20 February 2008. Archived from the original on 25 February 2008. Retrieved 20 February 2008. ^ "Ground-based Midcourse Defense (GMD)". MDA. Archived from the original on 6 December 2010. Retrieved 8 February 2011. A total of 30 interceptors are planned for deployment by the end of 2010. ^ PBS. The NewsHour with Jim Lehrer. A VIABLE DEFENSE?. 28 January 1999. This page was last edited on 5 April 2019, at 03:42 (UTC).